How to remove and replace your iPhone 6 display. We couldn’t wait for an iPhone 6 with a broken screen to come in so we decided to take apart a new one to create an iPhone 6 screen replacement video. Fortunately this job turned out to be relatively easy. It was in fact very similar to the iPhone 5 screen replacement procedure and can be completed by most technicians within about twenty minutes. 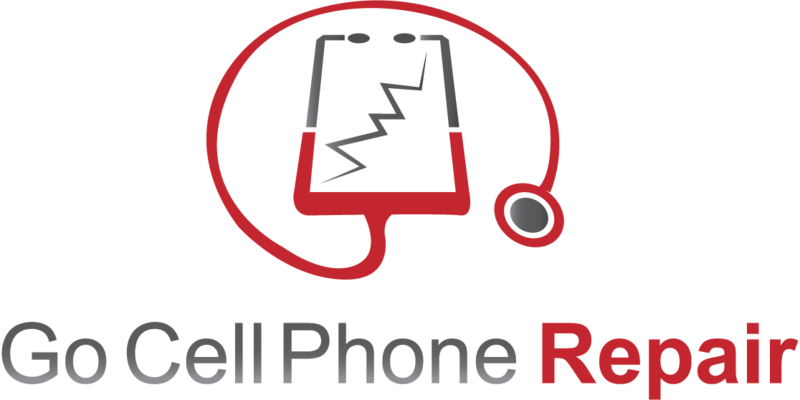 If this is your first repair then you should allow yourself more time of course and keep in mind that if you aren’t careful you can cause irreversible damage to your phone. When in doubt contact a professional. You can purchase replacement screens from the links below. Tools required to replace your iPhone 6 display are also listed further down. OEM Front Face Camera Proximity Light Sensor Flex Cable For iPhone 6 4.7"
Without the right tools your chances of success are greatly diminished. We start by powering off the phone and removing the two pentalobe screws adjacent to the lighting port. Magnetizing your bit beforehand will make this easier so while not necessary you will probably find a magnetizer very useful. 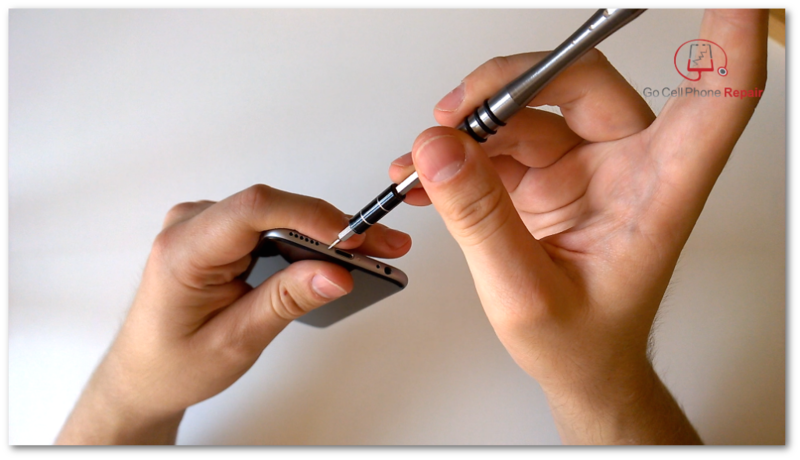 Unlike the iPhone 5, 5S, and 5C the iPhone 6 does not require much in the way of opening tools. We were able to fit a thin plastic pick between the lens and frame at the bottom end of the phone and carefully work our way around the edges. You don’t need to go all the way to the top of the phone just make sure that the display assembly is disengaged from the frame at the bottom and about three quarters of the way up the edges. There is no flex cable connecting the fingerprint scanner to the logic board at the bottom end of the phone so you won’t need to worry about tearing it as was the case with the previous generation iPhone 5S. This cable has been moved to the top end of the display where the LCD, digitizer, and front facing camera cables are located. You may need to slide the display toward the bottom end of the phone in order to disengage the tabs at the upper end that tuck under the edge of the housing. At this point you can carefully open the phone by lifting the bottom end up. Don’t open it too far as you may cause stress on the flex cables at the top. We recommend propping the display against something once it is perpendicular to the phone. We will now disconnect the battery. It is always a good idea unplug the battery as soon as possible as this will reduce the chances of causing electrical shorts inside of the phone. The backlight for iPhone displays are traditionally very sensitive to damage caused by electrical shorts and liquid damage. While you will be replacing your display there is always a possibility that you can recycle the old one assuming that it still retains partial functionality. There are two Phillips screws that can be removed from the retaining plate on top of the battery terminal. Once these screws are out move the plate aside and you will see pop connector. Carefully pry the connector straight up toward the ceiling from the side opposite of the battery. Now that the battery is disconnected we can proceed to the next step. The display is connected to the logic board with four flex cables. You can access these cables by first removing the retaining plate at the top right end of the phone. There are five screws that must be removed from the retaining plate. As always be sure to keep these screws organized so that you will know where to put them when assembling the phone. There are many screws of different sizes inside of the iPhone 6 and placing one in the wrong spot can damage the threads or the phone. After the plate is removed you can disconnect the flex cables. From this point you can set the phone aside. It’s time to transfer the hardware from the old display to the new one. Typically your replacement part will come with an LCD, digitizer, and side frame. Most of the other components that attach to the display assembly must be salvaged from the original display assembly. At the bottom of your old display there are two screws that hold another plate in position beneath the home button. Remove these screws and the plate. On the left side of the home button is a pop connector. Go ahead and unplug this also. This is a good time to remove the retaining plate behind the earpiece speaker at the top end. There are two screws that you will remove in order to release the panel. Once it comes off you can also take the speaker out. Next we wan to remove the metal panel behind the LCD. There is a screw at the top end and one at the bottom. There are also three screws along each side of the panel. Note that before we can remove the panel itself we will have to heat and pry under the cable at the bottom that is glued to the panel and the display. Be careful as tearing this cable will mean that you have to replace it. We found that this cable was very sticky so exercise extreme caution. Patience and a heat gun will make your chances of success without additional damage far greater. With this in mind you can proceed to remove the metal panel. You should now remove the front facing camera and proximity sensor cable. These will have some adhesive holding them in place so once again be sure to apply heat and carefully pry them off of the display. We found that the mic attached to this cable took some effort to free from the rubber interface also. If your replacement display doesn't have a plastic ring where the front facing camera goes then you will want to carefully heat and pry the old one off and transfer it to the new part. Some 3M adhesive can be added to hold it in place. Just make sure not to block the cameras view through the lens window. The same goes for the proximity sensor. There is a rectangular shaped piece of plastic that keeps it in the correct position. You will also want to transfer your home button to the new display. Be careful not to tear the rubber gasket that surrounds the button. This helps to keep dust and moisture out of your phone. It may be necessary to use heat here as well. Once you remove the hardware and transfer it to your new display you can reverse the steps above to re-assemble your Phone. If you have any questions or comments about iPhone 6 screen replacement please post them below. I have updated the links for the display. The whole part costs about $131 as of today.